I have been hiking and backpacking for over 15 years. A great deal of the backpacking that I do is related to mountaineering and rock climbing in the Pacific Northwest. When not climbing, I�m a hiker that tries to go light in order to push more miles. My main areas of exploration are the Washington Central and North Cascades, but I have done lots of hiking in the British Columbia Coastal Range as well as the Oregon Cascades. I am also an avid adventure racer and compete in several races each year ranging from 2 hours up to several days in duration. The Brooks-Range Sharktooth Mini Pro is a lightweight, aluminum shovel that is designed for all kinds of winter use. The shovel features a serrated leading-edge on the shovel blade, which is also where the shovel�s name comes from �Sharktooth.� The shovel comes in four removable parts: the D-shaped handle, two aluminum shaft pieces and the blade. The shaft is built so that the shovel can have a length of either 35� (90 cm) or 44� (112 cm). The shovel can be adjusted in the field is the circumstances call for additional leverage. The pieces are connected with an easy to use push-button lock system. Per the Company�s website, the shaft pieces can be used as an emergency deadman anchor. They also work in conjunction with the Company�s emergency Mountaineering rescue sled. The telescoping design of the shaft pieces also (per Brooks-Range) gives the Sharktooth Shovel the longest shaft of any shovel in the market. The Blade features the aggressive serrated edge and also has two small holes in the blade, which appear to be created in order to keep the weight of the shovel to a minimum. 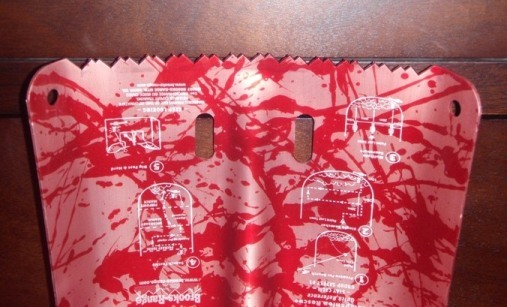 The shovel also has five descriptions of some common avalanche safety items drawn on the front of the blade. The hand is the only piece that is not made of aluminum, but rather it is constructed out of plastic. The handle features a nice wide grip and has the same push-button design used on the shaft to connect the handle to the rest of the shovel. Brooks-Range also offers a chance (if you order from them direct) to have your shovel custom engraved with your name for an additional $10 (US) charge. I am very much interested in the serrated blade. I have only used shovels that have flat edge on the blade, so I am very interested in finding out what type of impact this will have on the performance of the shovel. Will this enable me to better dig into hard icy conditions? I have also found that the shovel is very easy to adjust to which ever length I want. The push button locking system is very easy to use. The handle seems to be well constructed and fits nicely in my hand. It has a nice wide opening for my hand to fit into and the diameter of the handle fits great with the size of my hands. I like the fact that Brooks-Range takes the time to add the quick little safety instructional worksheets as it shows that they care about the safety of their customers. I am very excited to test this product as it has lots of great features. All in all this appears to be a pretty tough shovel that has some great special features. My main areas of exploration are the Central and North Cascades, where I should be at altitudes ranging from sea level up to 9,000 ft ( 2743 m). Currently my fall/winter schedule includes a trip to Mount Rainier National Park to explore the Tatoosh Range, a planned through hike of the Enchantments in the Central Cascades to enjoy the fall larches and hopefully a trip Oakridge, OR to further explore the area around Lake Waldo. Likes:The wicked design of the teeth and the adjustable length of the shovel shaft. 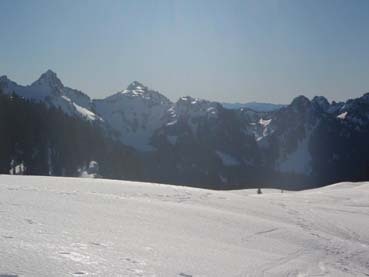 During the testing period I have been able to take two snowshoe trips in the Central Cascades region and I spent a week down near Mt. Bachelor in Central Oregon. During my trips in the Central Cascade, both of the trips I did were approximately 7 miles (11 km) round trip. Both outings featured deep fluffy snow (which is a wonderful change from the typically wet heavy snow that the Pacific Northwest typically sees). My trip to Mt. Bachelor featured snowshoeing just outside of the City of Sunriver and exploring the areas adjacent to the ski area. Overall during the field report period, my region has seen some extreme conditions; going from the Seattle region being gripped with several snow storms to a Pineapple Express system that brought tons of rain and massive flooding to the area � both of which has brought extreme avalanche conditions which has made it difficult to get out. Prior to the snow storms in December, the mountains in my area had been experiencing very little mountain snow. Thus I it has been difficult for me to get out as much as I normally do, first because of not enough mountain snow and then essentially too much mountain snow causing avalanche conditions. I actually think the best use of the shovel that I experienced was during the few weeks of snowfall that I experienced at my house. Over the few weeks I had probably about 16� of snow. While commuting to work I carried the Sharktooth Shovel with me each day and ended up helping five stuck motorist dig out there vehicles. I spent a fair amount of time using the shovel in my work�s parking lot, just helping people park and then leave their parking spot. I also used the Sharktooth Shovel to build two snow caves near my house. During one of the snow storms that I experienced, the area near my house experienced some strong winds � thus leading to some massive snow drifts. One of which was a six foot drift that was across the street from my house. I proceeded to practice making snow caves with the Sharktooth Shovel. It was the perfect situation to build an urban snow cave. I also used to the shovel when we experienced a massive snow melt when we experienced a Pineapple express system that moved through the Northwest. My street experienced some urban flooding due to piles of snow trapping in the rapidly melting snow and rain. I ended up using the Sharktooth Shovel to dig out storm drains that were covered with a layer of ice and snow. The trapped water on my street was about 4 inches deep. Some great Washington Cascade views! While building caves with the Sharktooth I loved the serrated edge. I really enabled me to dig into snow and ice and really carve out a nice shape. Based on other shovels that I have used in the past, the thickness on the blade of the Sharktooth Shovel is much greater than any that I have used. This makes me fell like the shovel is stronger and gives me good piece of mind when chipping away at ice and compact snow. I always think that in a mountaineering situation, having trust in your gear is very important and the way the Sharktooth Shovel is constructed I have great faith in its construction. Now how that holds up over time will be something to look at during the Long-Term Report. I liked the adjustable length of the handle as it was nice on my back to be able to make the shovel longer. Based on my height of 6'0" (1.83 m) I found that the fully extended shovelwas comfortable for me while digging. So far I have enjoyed using the Sharktooth Shovel; however I think that my field report is a little bit incomplete as I need to get out into some backcountry conditions to thoroughly test the shovel. Likes: The wicked design of the teeth and the adjustable length of the shovel shaft. Dislikes: Possibly the lack of being able to only take one of the adjustable length pieces rather than been required to take both pieces no mater what length of handle I choose. During the testing period I have been able to take a trip to Mt. Rainier National Park (hiking up to Panorama Point). I used the Sharktooth to set up an awesome lunch spot by digging out some great seats! I also did my usual assortment of local hiking on the �Issaquah Alps� peaks and Mt. Si near my house (5 separate trips). I also did a winter ascent of Mt. Ellinor (6,000 ft � 1800 m) in the Olympic Mountain Range (I thought for a moment the shovel was going to be used to dig out my car!) However on the trip there was actually very a low snow pack. During my trips in the Central Cascade I did trips that where both approximately 7 miles (11 km) round trip. Two outings featured deep fluffy snow (which is a wonderful change from the typically wet heavy snow that the area typically sees). The third featured breakable crust. My local trips consisted of Mt. Si (8 miles � 12 km 3,000 ft � 1200m of gain) and Tiger Mountain ( 6 miles � 10 km 2,000 ft � 600 m of gain). I have really come to like the serrated edge of the shovel. It cuts in to hard pack snow and ice and I found it to be a great shovel for building snow caves and creating �living areas�. I found that on Mt. Rainier I was able to put together four nice seats in a short amount of time even though I was working through some pretty hard packed snow. I also found that when the handle is fully extended it is great on the back. Many shovels only come in lengths that are similar to the Shark-Tooth when it is not extended, thus having the option for a longer handle is a wonderful. There is nothing worse than a long day of hiking and then having my back worked over by a short shovel! I found myself to have a lot of confidence in the blade strength. I know this seems sort of silly and hard to quantify, but for many years I used a shovel that had a hard plastic blade and honestly, when dealing with very icy conditions, I almost found myself waiting for the blade to break. Thus, in many cases I probably ended up not being as aggressive with the shovel as I could have been. However, this is not the case with the Shark-Tooth. I will slam the blade into solid ice and not think twice about it. I would for sure have full trust in this shovel in bad conditions which for me is the mark of a good piece of gear. I wish that one of the arm pieces could be left behind. Granted, I love the length that it provides, but lots of time during trips, a shovel is more an emergency piece of gear � thus, if I could shave some weight and bulk from my pack that would be great. I plan on using the Brooks-Range shovel for any trip that demands or may demand some technical snow shelter construction. I found that the strength of the blade coupled with the serrated blade and long extending handle make this shovel a good workhorse for building a snow cave or a campsite. The Brooks-Range Sharktooth Pro Mini Shovel is a very effective tool for dealing with hard pack snow and ice. The edge is ideal for cutting into ice and carving out a great snow cave or other camp structure. 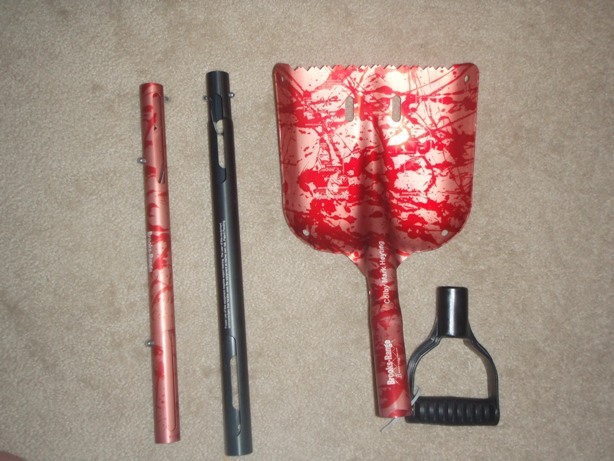 The shovel is easy to put together and features a great handle (that can even be removed for easier packing.) It features two adjustable handle lengths. The long fully extended handle provides a great longer length that is nice on my back. All in all a great choice for more technical snow endeavors. Likes: The "Sharkteeth" they not only look sweet but work great in the field. Dislikes: Again - the lack of being able to only take one of the adjustable length pieces rather than been required to take both pieces no mater what length of handle I choose. This concludes my Test Report. Thank you to both BackpackGearTest and to Brooks Range for this fantastic opportunity to test the Sharktooth Mini Pro Shovel.